A computation(e.g., a function call) will not always succeed, and the failure can be represented by a null value. 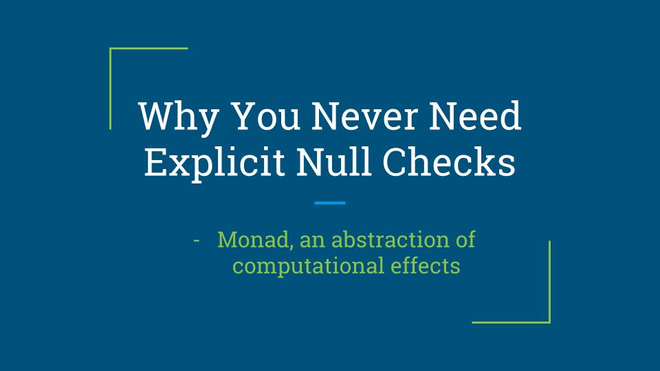 To build robust programs, the intuitive way is to perform explicit null checking like if (null != aVariable). However, indentation may go so deep to harm code quality. Actually, null checking can be done implicitly at each step of the computation. And this talk will demonstrate how to implement the automatic null checking, which reflects the most important use of monad in programming languages: capturing computational effects such as failure, non-determinism, state, and IO. The speaker, Zirun Zhu, is a PhD Candidate at National Institute of Informatics (NII). His research area is bidirectional transformations (BXs), which can serve as an elegant approach to synchronizing data in different format. In particular, he is focusing on the synchronization problem between the program text and its abstract syntax representation. He developed a domain specific language – BiYacc – to help the user build a pair of parser and reflective printer from a single program. WangFangda published WebHack#10 Why You Never Need Explicit Null Checks. WebHack#10 Why You Never Need Explicit Null Checks has been published! I joined WebHack#10 Why You Never Need Explicit Null Checks!